As a “Digital Nomad”, keeping my files, photos and miscellaneous digital ramblings safe is kind of a big deal. I make my living via my laptop and the prospect of losing my data is a very real concern. When my Macbook Pro finally decided to give up the ghost, I was lucky in that I was able to recover the majority of my photos, emails and design files. Unfortunately, they were scattered all over the place after being salvaged by software that just dumped everything into random folders named “00085″ and such. There are over 5,000 such folders — not terribly convenient. 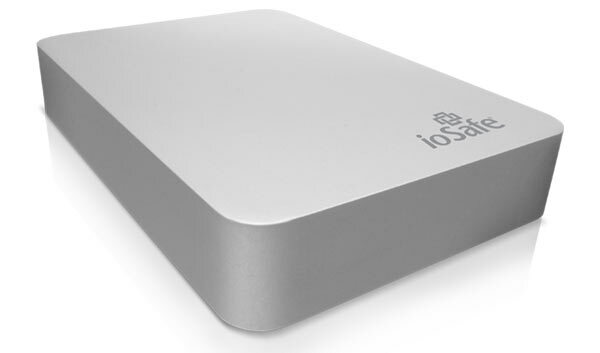 Enter the ioSafe Rugged Portable Hard Drive. When ioSafe contacted me to ask if I’d be interested in testing one of their drives, I was still dealing with the aftermath of the HD meltdown and the idea of a bomb-proof uber-drive sounded pretty appealing. What do I mean by bombproof? How about a drive that can be submerged in 30 feet of water for 3 days and still work? Or be driven over by a two-ton truck? Drop it from twenty feet? No problem. Hell, you can soak it in diesel for an hour and still not lose data. This thing is a tank. If you’re hiking the Inca trail, this drive is rated at use over 15,000 feet — which is probably more than your laptop drive can handle, so don’t get carried away. And if you do manage to break it, ioSafe promises up to $5,000 credit towards recovery service support. And as far as I can tell, this little monster lives up to the claims. It’s a veritable brick of solid aluminum, a true ‘black box’ for your computer. The test model I received is a 500GB drive — a bit small, capacity-wise, compared to modern portable drives. I partitioned mine, creating a 100GB space that houses a full copy of my system, then setting the other 400GB to be devoted to backups. This will be my “if all else fails” backup drive. Other than weekly visits to my laptop for backup, this baby is going to ride in the bottom of my main pack. Did I submerge it underwater for 3 days? No. But I did drop it from 8 feet or more and stomped on it, only to find that it worked as normal — no loss of files or problems mounting the drive. I there is one weakness of using this drive while traveling, it’s weight. This bad boy weighs over a pound and it is noticeably heavier than my other drives. The tradeoff is durability, obviously, but carrying a 500GB drive that weighs as much as 2 drives sporting over 4 terabytes in capacity does chafe a bit. I’m sure capacity will continue to scale up. Armored cars tend to weigh more as well, so the added heft is no surprise. If you move around and you have files that you absolutely don’t want to lose –or can’t afford to lose– then I recommend giving the ioSafe a look. At $250 for a 500GB drive, it isn’t the cheapest and it’s certainly not the lightest drive available. But the weight it will lift from your shoulders just might be priceless. Interesting. A bit pricey and the weight would bother me but the durability is pretty sweet. I got a Western Digital 2TB portable in September that only lasted three months on the road, so maybe this one might be a good investment. It’s the weight that would be the decider for me though. BTW I think you got your GBs and MBs mixed up halfway through the article. Thanks for catching that, Will. Brain fart. As for the drive, yeah, the weight is rough and I’m still debating whether or not to lug it around. If it was 1TB or more, I’d be more enthusiastic. Unless the drive in your Macbook Pro succumbed to one of the aforementioned features of the IOSafe (water damage, fire damage, shock damage, altitude damage) then there’s no reason it would be more reliable than your dead drive. Hard drives fail internally even without physical damage. True data security can only be achieved with redundant drives (Google “RAID 5″). So unless you’re regularly taking your drive for a swim I can’t see any reason why this overpriced drive makes sense. I’m a bit surprised you had such a bad recovery scenario. I thought you’ve mentioned on several occasions that you have a 2 backup drives. Did your backup drive fail as well? I’m a PC guy and opted to buy a third party software over the Windows stuff. But I thought the Mac backup and timecapsule was supposed to be excellent. Time capsule is a great feature. I worked myself into a corner where I hadn’t backed up in a month and had a LOT of work. So when my system crashed, I didn’t want to recover from an old backup. So I limped along and things, of course, got worse. And to clarify — 1 drive is a dedicated time capsule backup. The other is purely for photos. They start at $250. They’ve just released a 1TB version and told me they’re working on a 2TB as well. It’s definitely a premium price (I bought a cheapie 2TB for $140) but it’s as solid as I can imagine. Apart from having an extra drive, I would suggest backing up data on the cloud using services such as Dropbox. Great idea for back up, are the plugs 3 prong ? or two. My converter can only handle two pronged plugs. Thanks for sharing. Sounds like I great product. Would have loved to help you “test” it! Based on my research so far anyways, these bullet proof type hard drives all seem to weigh quite a bit more than the average hard drive. Not terribly convenient when you’re on a 2 week hike, but I have to agree. For the added peace of mind knowing that your stuff is all safe and secure, I think it’s worth it. They are quite heavy — easily twice the weight of a similar portable HD. But they are solid and if you really need something to depend on, they’re worth a look. I’ve been looking to get a rugged hard drive, I might pick up one of these or the bigger capacity one, once it’s released. Sounds like the drive to have. A friend of mine dropped his portable terabyte and everything was history, will tell him about this one. Does not sound too convenient but I guess in the long it will prove its worth. Wow, that thing is a tank. Both of us here use Silicon Power Rugged Armor external drives. The 1TB version is under $100, and they are shock-proof and water-resistant. One user has a test video on Amazon, complete with submersion and shock-testing. They’re barely bigger and not much heavier than the WD portable drives we previously had. It’s barely bigger or heavier than the WD portables we had before (still have one with music on it), and I can’t imagine it’d be too big or bulky to move with. Specs say the Silicon Power ones we have are 9.6 oz, and the WD My Passport is 6.4 oz. The ioSafe joint is 1 pound. I suppose every ounce counts, especially since you’re backpacking. I really wanted something tiny, like those micro drives that come in 1TB versions, but I didn’t want to sacrifice safety in order to save a few oz. After 8 months, I’d buy the SP drives again. P.S. Glad to see you’re blogging more again. Randomly hit your bookmark on my tab the other day and saw new posts. I hadn’t been back in a while during your ‘hiatus’ for lack of a better term. P.P.S. Sorry, I misread your reply and thought you were saying you left an SP drive at home. Ignore my retort at the beginning. Haha! That was the last time i would trust myself with a hard drive, so these days I back everything up online via Dropbox. It’s expensive, but it’s so worth it!!! I def need one of these….or two!!! Also, Im coming back to Nicaragua for 6 months in September if you’re still around! Can recommend LaCie Rugged Mini. They are compact & lightweight.